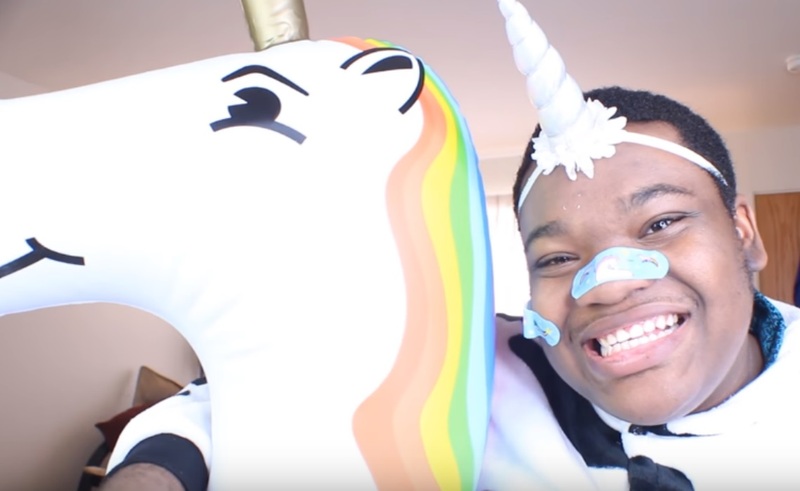 In the six years comedy and satire creator Machaizelli ‘Mac’ Kahey has been on YouTube, the 21-year-old burgeoning star has boycotted Beyoncé (for being too perfect), given the world legendary reactions to homophobic content, and recently went on tour with Fullscreen Live – treating fans to a giant dose of his positivity-infused-but-still-critical charisma IRL – all the while giving individuals in at least a few marginalized areas of our society a fun, energetic space in which to be entertained. And, of course, his rapidly-growing YouTube channel MacDoesIt has already hit 1.2 million subscribers — making him an official member of the YouTube Millionaires club. Mac Kahey: It feels completely unreal to the point that it is practically dangerous. I feel like I’ve activated a new power that I still don’t know how to use, but like, in a good way! Honestly, thank you to all the people that decided to invest in the content and the lifestyle I live. You guys are helping me open doors I never thought I’d open. MK: Absolute boredom with a mixture of “I can do that” syndrome. I did theater for a big portion of my life and have always been a person that loves to entertain an audience. I was also (and still am) a huge fan of YouTubers, and after watching them for so long I decided to give a crack at what they do. MK: I think it’s the way I approach certain topics and trends along with my very “whimsical” editing. As I’ve been told, I’ve found a way to take hard-hitting topics and discussions between family and friends and turn them into a fun pastime and a way to laugh at society’s hypocrisy without feeling like the world is burning. TF: How do you think the advent of platforms like YouTube has changed life for young LGBTQ+ people? MK: YouTube and the internet have made a home and place for many secluded and oppressed groups. YouTube has made the LGBTQ community feel normal. Seeing faces and people that look like you in media is important, and platforms like this have helped many more people feel like they belong compared to traditional Hollywood. TF: What’s the most ridiculous response you’ve ever received to one of your videos? MK: One person recently just made a video critiquing my entire existence on the platform — completely missing the fact that I am a satirical channel. Many of the things I say or do are purposely over the top for the sake of comedy, and the most ridiculous comments are always from people who take my movements at just face value. TF: What do you enjoy about watching and reacting to anti-gay commercials? MK: I’ve always liked laughing in the face of unprompted hate. I find it so weird that people take time out of their life, from improving themselves and their surroundings, to try and lower someone else’s existence and mood. Also, as a person that was raised religiously, I’ve always loved to open up conversations about the hypocrisy of modern-day constructed religion while also promoting the idea of human respect. TF: On a similar note, what do you find fascinating about awards show fashion? MK: The fact that a man’s fragile masculinity shines the BRIGHTEST during award shows or fashion events like the Met Gala. Like seriously? You’re gonna go to the biggest events in Hollywood history in a plain black suit? I’m also a huge fan of avant-garde fashion, so I absolutely melt when a celebrity shows out in a signature McQueen. TF: What was the highlight of your recent tour? MK: The fact that it happened! I’m still in disbelief that I actually went on a three-month tour that technically hasn’t ended yet. My favorite part was meeting all the people that watch my videos and putting a face to my audience. A lot more parents watch me than you’d probably expect. I especially love how intimate the VIP meet-and-greets were, the questions and stories I’ve heard from many of my viewers made it clear to me that I’m making a difference in their lives. MK: Everything is in the beginning process right now. I have so many ideas, but only one body, so I’m currently trying to learn how to portion myself in everything I want to do (shout-out to my managers for that). More immediately, I’m trying to get more collaborations rolling around to show people that I have friends…sometimes. You can add yourself to the ranks of Kahey’s more-than-a-million YouTube subscribers and check out his channel for yourself at YouTube.com/MacDoesIt.